Getting a good night’s sleep can, quite literally, change our lives; yet so many of us settle for less. Neck pain is a huge cause of sleepless nights and with up to 85% of the American population suffering from either back or neck pain at some point in their lives – it’s clear we’ve got a problem. Aches and pains heavily contribute to bad quality sleep and, in a culture that tends to neglect sleep anyway, we really do need all the help we can get. In this guide let’s take a look at Cervical Contour Pillows – a very good option if you suffer from neck pain. We’ll consider the benefits, what materials and shapes to look for, and which ones we think are the best. First up on the first is the wonderful cervical pillow from Perform Pillow. It uses specially designed foam to ensure your neck is properly supported. It’s designed, tried and tested by a chiropractor with over 20 years’ experience and uses extra breathable, high-quality memory foam which retains its shape for years. Coming in either a medium or a thick profile, the Perform pillow is certainly a little less affordable than the others but, in our opinion, it’s totally worth it. The bamboo cover is soft, machine washable and resistant to bacteria, plus the foam inside is eco-friendly meaning you’re saving the planet as well as your neck! Both the high-quality foam and the bamboo cover are hypoallergenic and dust mite resistant, meaning it’s a great choice for those who struggle with allergies. Plus, the bamboo cover allows air to flow, so no sweaty head and neck in the night! This pillow is both heavier and pricier than some of the others on our list, but the high-quality foam, chiropractor approval great shape and attractive exterior make it a great choice. It does a fantastic job at easing shoulder and neck pain and can be sent back within 30 days for a full refund if you’re not happy. A slightly cheaper option, the LANGRIA high density memory foam is a great choice for those of you who want all the benefits of a cervical pillow without the price tag! Reducing snoring and cradling your upper back, head, neck and shoulders, this pillow maintains the natural curve of your spine easing neck pain and helping to relax the muscles. The slightly more unique thing about this pillow is its shape. The center cavity cradles your head and supports your shoulders, making it ideal for back sleepers; while the convex side panels are at shoulder height, great for those who sleep on their side. The memory foam is high-quality, antibacterial and moulds well to your body shape, distributing your body weight evenly. Plus, the knitted fabric pillowcase is breathable and cool. It’s safe to say that we love this pillow! It’s comfortable, soft and doesn’t get excessively hot. The only downside is the slight chemical odour, which unfortunately is the norm with memory foam products. However, this will dissipate if you air it out before using. Next up is the Cosium cervical contour pillow. 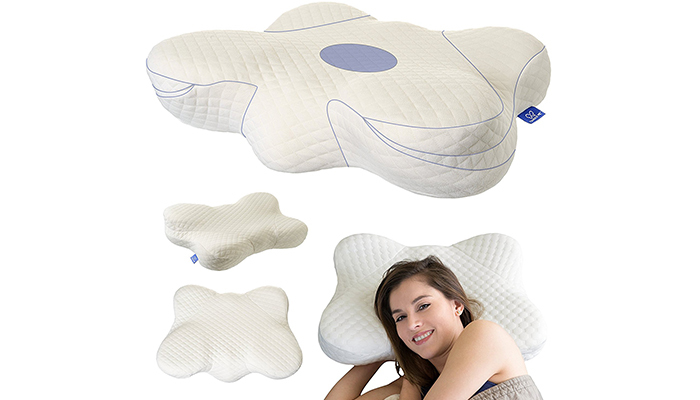 Another unique shape, this ergonomic pillow provides fantastic support to your head, shoulders and neck while also improving blood circulation and reducing snoring. It’s suitable for any virtually any sleeping position – stomach, back, side and it’s also comfortable for pregnant sleepers thanks to its unique butterfly shape. Just like the others on our list, the pillow case is hypoallergenic; made of Polyether and Mesh fabric. Removable, washable, and resistant to dust mites, the Cosium contour pillow is ideal if you suffer from allergies. The mesh fabric case lets the air circulate, keeping the pillow cool throughout the night. Perhaps most impressively is the Cosium’s adjustable height. The detachable foam layer at the bottom of the pillowcase is 1 inch in height, meaning you can adjust the height to suit your way of sleeping. The memory foam used is also high-quality although, like many of its kind, may have a slight odor when it arrives. The NURSAL contour pillow has a distinctive, half-moon design which neutralizes the spine, supports the neck and head, and relieves pressure. The memory foam is visco-elastic, actively cradling your neck and moulding to your own unique shape. When the pressure of your body is removed, the pillow will gently return to its original shape. The cover is soft, washable and comfortable. Like many others, we found this one to have a rather, ahem, unappealing scent, however airing it out did get rid of this. It’s also a fair bit thinner than some of the others on this list, meaning it’s not so good if you need your head slightly more elevated. However, the NURSAL holds its shape well, is of a great quality and comes with a 2-year warranty guarantee. It’s affordable, comfortable and an all-round great choice of pillow to ease neck pain. Next up is the MEJOY memory foam pillow, designed specifically for both neck pain and headache relief. This pillow is a great quality and well-made, but not hugely expensive. Like others, it moulds to your body shape to keep your spine in place, relieving neck pain and relaxing tightened muscles. The memory foam is breathable, keeping cool in the night, while the pillow case is made of a wonderful bamboo charcoal fiber which is antibacterial, skin-friendly and allows air to circulate. It also claims to cater to all sleep positions – back, side and stomach. Like many cervical pillows, it’s a lot smaller than what many people are used to, which is why it’s essential to give yourself time to adapt to it. 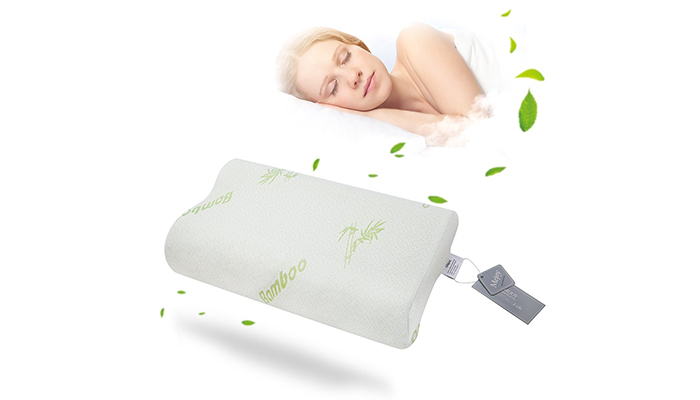 While this one is certainly on the smaller side, it’s still a good option for those who want a cervical pillow with that lovely cooling bamboo fabric and is ideal for someone with more sensitive skin. Back up to something slightly more high-end and we’ve got the Cradle Me cervical pillow. Made using high-quality memory foam that keeps its shape, this pillow does a great job in supporting your head and neck during the night. The best thing about this pillow? The memory foam is odourless, meaning it’s not necessary to air it out before use. Just like the Cosium contour pillow mentioned earlier on our list, the Cradle Me cervical pillow comes in an effective butterfly design, with the ‘wings’ rising up to cradle your head in place. The 3D contours provide support for virtually any sleep position, and the pillow can be flipped turned around to suit your needs, ensuring maximum comfort. Cradle Me believe that ‘life is too short not to feel your best’, and let’s face it, we’re all aboard that motto. Getting a good night’s sleep is so important and Cradle Me knows this. For this reason, you can be sure that their cervical pillow is designed specifically with you and your comfort in mind. What else do we love? Well, there’s a 100% satisfaction guarantee which makes the high price tag slightly more appealing. The foam is nontoxic and hypoallergenic meaning it doesn’t trigger allergies, and it’s a good size making it seem even better value for money. It doesn’t come with the cooling bamboo case like others on our list, but the ergonomic design and perfect level of firmness more than make up for it. Last but certainly not least is the Cr Sleep Memory Foam Contour Pillow which, although the cheapest on our list, certainly doesn’t sacrifice on quality. This pillow lacks the unique shape of some of the others, but its contour wave design still promotes proper spinal alignment and encourages muscle relaxation, preventing neck pain and helping you to have a better night’s sleep. Plus, as one of the cheapest on our list, it’s a total steal for those of you on more of a budget. The Cr Contour has both an outer and inner cover. The outer is made of polyester and tencel, which is both removable and washable. The inner is a jersey fabric which helps ventilate the air flow and keep the pillow cool. The inside contains a high-quality gel-infused memory foam, which has no toxic ingredients and provides a protective barrier against dust mites and other allergens. Although the product description lists that you may experience the odor that comes hand in hand with most memory foam products, we didn’t notice it. All in all, the Cr Contour pillow is a reliable and low-cost choice, and it comes with a free sleep mask to enhance your quality of sleep even further. A total bargain in our eyes. Neck pain isn’t only caused by being hunched over a laptop all day, your pillow can also have a huge effect on the way your neck is positioned during the night. Choosing a pillow that is specifically designed to help with neck pain will help reduce neck pain, while also helping you sleep better and go about your day with more rigour and enthusiasm than you might otherwise have managed. So, getting the right pillow is essential. But to even begin? Let’s take a look at the cervical contour pillow; a hugely worthwhile purchase when it comes to reducing sleep-related neck aches and improving your quality of sleep. While standard, everyday pillows can seem like the ideal place to sink down into at the end of a long day, the ‘sinking’ isn’t really doing us much good. We’re generally asleep for 7-8 hours a night, which is a very long time to be in the wrong position for. While sleeping, our spine should really be aligned, something that standard soft and squishy pillows often don’t allow. When our spine is aligned, it is neutral. This means there’s no extra tension, twists or tilts which, 8 hours later, can leave us feeling sore and stiff. A cervical pillow is a pillow which has been specifically designed to support the neck and keep our spine aligned. Not only that, but they are generally more comfortable (once we get used to them!). The result of using a cervical pillow long term should be decreased neck pain (or ideally none whatsoever), a better-quality sleep and a better attitude or zest for life the next day! Aside from relieving neck pain, cervical pillows have a whole host of benefits, especially when compared to their soft and squishy equivalent. Firstly, a cervical pillow provides supports all night. 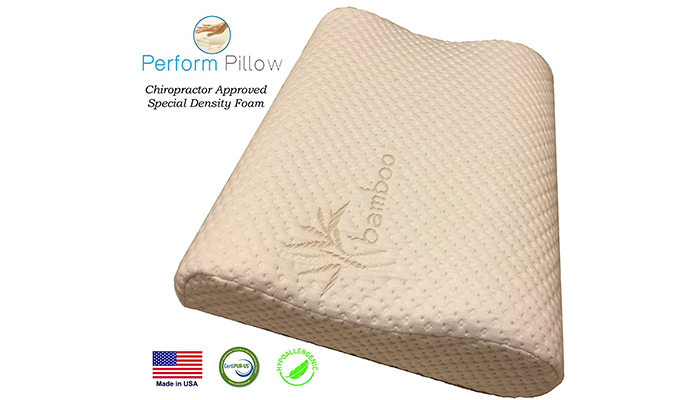 If you invest in a good quality memory foam cervical pillow, it will maintain its shape all night, ensuring your spine remains neutralized for the duration of your sleep. This will relieve shoulder tightness, pressure, knots in your shoulders and even reduce headaches. Plus, going about your day with an upper body free of pain will improve your posture and ensure you don’t do further damage throughout the day. Using a cervical pillow can also prevent neck and back pain further down the line. We all know the effects of sitting in an office chair day after day with bad posture. While we may not necessarily feel it now, we certainly will in a few years’ time. It’s the same with sleep! Constantly sleeping with our spine twisted, in an awkward position or compromised will ensure that even if you don’t feel pain right now, it won’t be long until you do. Perhaps the most commonly overlooked benefit of buying a cervical pillow is the fact that it’s comfortable! Not only is waking up without neck and back pain a total delight, you’ll also most likely wake up feeling more refreshed than usual as, thanks to their comfort-in-mind design, you will have slept a lot better than usual! Remember that these are not your bog-standard pillow. Cervical pillows mould to fit your shape and often have been designed or at least tested by chiropractors. They are generally made from breathable fabrics which allow cool air to circulate meaning there’s no need to flip it over multiple times in the night in order to get the cold side of the pillow! But that’s not all; cervical pillows can also accelerate blood circulation, reduce snoring and help to cure insomnia. it’s essential that you purchase a pillow which supports you properly in all three positions sleep positions – be in side, front or back, to ensure you maintain the correct spine alignment no matter how you sleep. This is even more important if you already suffer from neck pain, as getting the wrong pillow could even make it worse. Cervical pillows are great because they support the neck and keep the right spine alignment no matter what position you sleep in. Cervical pillows can be a little costlier than your regular pillow, purely because they are designed for those with neck pain and do more than just provide somewhere for you to lay your head! For this reason, it’s wise to choose a pillow made of high quality materials, and dense enough to last for a long time. Choose a high-quality pillow and you’re also unlikely to have to replace it as regularly as you might as normal pillow. When it comes to cervical pillows – memory foam is the obvious choice, as it cradles itself to your own body shape, rebounding slowly and retaining its shape for a long time. The only downside is that memory foam pillows can get warm and lose their shape, but purchasing a high-quality pillow should stop this from happening. For the outer case, bamboo is an excellent choice thanks to its ventilating properties. Be wary of cheaper pillows which might compromise on the material of the outer case as these are the ones which are likely to get hot, making your night far more uncomfortable than it would otherwise be. Other choices of material are Polyester fibre or latex foam. Choosing the shape of your pillow depends on what type of sleeper you are and your own personal preference. Those with more severe neck pain should be a bit pickier and someone who’s pregnant may require a totally different shape to someone who often sleeps on their stomach. The shape of your cervical pillow shouldn’t matter too much, as they are all designed with the same goal in mind – to ease neck pain and support the spine. However, that’s not to say there’s not a huge amount of choice out there. The wave design is perhaps the most common, as it keeps the neck elevated and the spine neutral. There are also many different variations on this design, providing more or less support as needed. Another good shape is the butterfly design, which provides slightly more support for your head. However, be sure to invest in a butterfly styled pillow made with cooling material, otherwise you may end up with hot ears! Don’t be fooled into thinking these pillows are like any other. In fact, we’d say it’s unlikely you will sink down into it on day 1, feel your neck pain ease within seconds and congratulate yourself on such a fantastic purchase. It’ll probably be the opposite. If you’ve never used a cervical contour pillow before, you may be in for quite a shock. They are smaller than your usual pillow, a lot firmer and often rather strangely shaped. Allow yourself time to adapt to your new pillow. It may well be too different to comfortably sleep for the entire night on. If it is, rest your head on it at various points throughout the day if you have time, increasing the duration as you go. Remember, while a cervical contour pillow may seem bizarre and totally contrary to what you’re used to, the benefits more than outweigh the length of time it may take you to adapt to it. We hope this post has encouraged you to invest in a cervical pillow to help ease neck pain, while also providing valuable advice on which one to purchase! It’s important to remember everyone is different. Your body shape, sleep position and movement throughout the night can all be a factor in choosing the best pillow for you – which is why it is important to take totally differing reviews with a pinch of salt! What may be the perfect pillow for some sleepers, may be a total nightmare for others. The best thing to do is to choose a pillow that allows you to return it if you’re not totally satisfied. If you have invested in a cervical pillow but your neck pain persists, it’s imperative to look at other factors. Sitting at a desk for 8 hours a day with poor posture will irritate your muscles and joints no matter how supportive your pillow is. Likewise, regularly taking a nap on the sofa, not making time to stretch or consistently sleeping on your stomach can also cause tension in your back, shoulders and neck. While painkillers can mask persistent pain, they are no substitute for professional advice! Fortunately, it can be easily treated and changing your pillow to something more supportive is a great place to start.